Not everyone knows light duty trucks like us. You really have to enjoy working on them like we do, we feel it’s important to be passionate about trucks in order to provide our customers with the best automotive repair and maintenance experience possible. It’s clear to us that a truck goes beyond a means of conveyance. It can be your livelihood as well as your hobby horse. That’s why we are happy to look at your light duty truck whenever you feel there might be an issue worth a check up. We can perform a digital vehicle inspection and provide you with a print out including pictures of the areas that may need service. Also if you need to come back to pick up your truck or you take advantage of one of our loaner cars we’ll save the broken components for your inspections. Once we get to know you and your truck we’ll be able to suggest a maintenance schedule that will work for both you and your lifestyle. We are available by phone, to drive ins or you can conveniently schedule an appointment online for a day and time of your choosing. 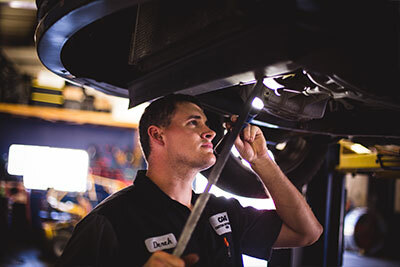 Feel free to let us know what you’ve been experiencing or what you think may be wrong with your truck. We will get back to you shortly to confirm your appointment and if we can’t fit you in the day you requested we will work with you to find a time that will allow us to give your truck the attention that we know it deserves. You can rest assured know that we have all the latest factory scanners, factory hand tools and specialty tools needed to service your light duty truck. If that’s not enough, you should know that we also attend factory ongoing training. This helps us stay up-to-date on all the current issues that could be affecting your truck now or in the future. We know what we need to do to service and maintain your light duty truck and think you should give us a chance when it comes to maintaining and repairing your valuable investment because we know you won’t be disappointed.